Not just a book. It's a conversation. Many Dimensions of Collaborative Learning: Where Are the Synergies? Even on our worst days, we’re learning. It’s a skill hard-coded within the human DNA for survival. But in the context of education and business learning agendas, perhaps we can raise the stakes a bit, if ask this non-rhetorical question: how could we get better at learning how to learn? As we attack this in the early months of 2013, I thought it might be useful to look at how learning is approached in a variety of different disciplines, to see where we might find common themes. This graphic was designed to get us thinking … and talking ..
I’ve attacked many of these topics in The DNA of Collaboration, especially as they pertain to Culture. Over in the #K12 #ECOSYS chat community, we’re about to do a deeper dive on the K12 Advanced Learning Models. In the meantime, lets keep the #CDNA conversation at a higher level for now, to explore the broadest synergies. As we look across disciplines, what might we gain? Here’s the chat format for the next several weeks at #CDNA, starting MON JAN 7 8pET. Q1. What are the most common, fundamental, intrinsic drivers of human learning? Q2. Who or what are the most important catalysts and motivators for this learning, over time? Q3. What can we learn from traditional classroom methods across K12, HigherED & Business? Q4. What advanced learning methods may be most interesting in this analysis? I hope you find the frame as intriguing as I did, when we started talking about it on Twitter in December. Interesting comments sprang from both my own sourcepov blog and our own new CDNA G+C Community “Collaboration DNA”. I hope you’ll share your feedback with us, as we explore each impact vector (row) and discipline (column) in turn. Our goal? To rigorously explore the possibilities of Learning How to Learn. You might say we’re using critical thinking to better understand and raise the bar on .. okay, you guessed it .. our capacity for critical thinking. This entry was posted on Sunday, January 6th, 2013 at 11:11 pm	and tagged with #cdna, #CollabDNA, collaboration, critical thinking, culture, learning, motivation and posted in critical thinking, knowledge management, learning, organizational development. You can follow any responses to this entry through the RSS 2.0 feed. « Learning to Learn: The Evolution of KM and OD; Can they work with Education to change the game? GAME ON. Our #orgdna #globalchat is now 3rd or 4th Saturdays. The conversation runs 2 hours, stretching to accommodate time zones. We’re discussing #complexity in the #futureofwork, with a Coggle as reference. At our NEXT CHAT 3/30, we debut our partnership with the Plexus Institute. 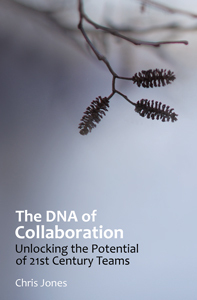 Peter Cook "The Music of Business"
THE DNA OF COLLABORATION – Unlocking the Potential of 21st Century Teams (2012). Why do teams fail? Working to solve problems in a group is hard, much harder than it sounds. This book explores the critical flow of insight in modern organizations, challenging leaders to rethink the potential of what a well-balanced team can discover.